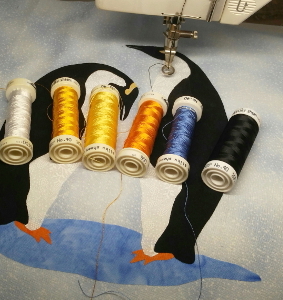 Applique Tips for Fusible Applique » What's Under the Needle? April is World Autism Awareness Month. In New Zealand, autism affects one person in every 100. That's around 40,000 of us! And every year during April, I put out a new animal block to add to the collection of animals drawn by my son who is autistic. One of my favorite things about this block is that it was so easy to put together. 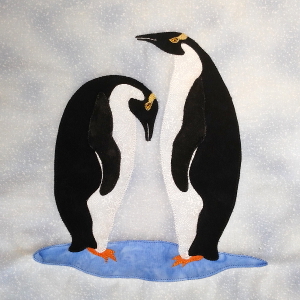 It literally took me only a couple of hours from start to finish using my original soft-edge applique technique.... but more importantly than time is the way I can stitch right into points, making them very sharp as you can see on the penguin's feet. I used a selection of rayon threads for the stitching, carefully selecting colors that were very close in color to the fabrics I used. In fact, I think those colors would be a great color combination for a bed quilt, what do you think? 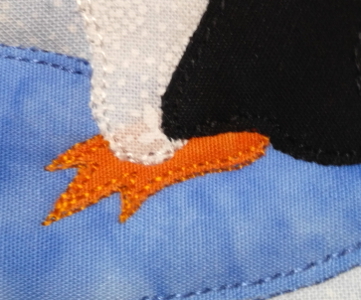 One thing I always do when stitching my applique is try to match the thread weight of the top and bobbin threads so the stitches form correctly without adjusting the tension. By doing this, I don't need to worry about the thread color on the bobbin because it doesn't show through to the top. I know some quilters cringe at the thought of raw edge applique especially using the free-motion technique I use so I'll tell you a little secret. Selecting great quality fabrics that don't fray such as Hoffman Fabric Batiks along with a new sharp needle in your machine, will make all the difference to your finished project. You won't have fraying and if you stitch around each shape twice, it keeps the raw edge flat to the surface preventing it from getting rubbed up and tatty.